May 22, 2018 DUBAI UAE – Following one of the most dramatic and competitive seasons ever on the PSA World Tour, the line-up for the season-ending ATCO PSA Dubai World Series Finals has been confirmed and the top eight male and female squash players in the world will descend on Dubai in just two weeks’ time to compete for the final title of the season. The fight for the points for the World Series Standings has been waged across the globe in eight World Series tournaments over the past nine months, and with the final qualification event concluded, the top 16 players will now battle it out for the coveted title at the Emirates Golf Club between June 5-9. After a nail-biting week of competition, last week’s Allam British Open saw Colombia’s Miguel Angel Rodriguez storming into the top eight of the men’s standings after winning his first ever World Series title in Hull. Rodriguez’s phenomenal run at the tournament means that England’s three-time World Champion Nick Matthew will not compete in Dubai after being knocked out in round two at the British Open, and the 37-year-old will now begin his retirement after hanging up his racket following a glittering career that saw him claim 35 titles. World No.1 Mohamed ElShorbagy leads the men’s standings thanks to a formidable season which has seen him take three World Series titles and finish runner-up at three. The Egyptian World Champion has been in stunning form and only missed out on final appearances at the J.P. Morgan Tournament of Champions and El Gouna International World Series events as he finished top of the standings with 485 points. He is followed by World No.2 Ali Farag with 360 points, after the Harvard-graduate enjoyed his best season to date on the PSA World Tour, winning his first World Series title at the U.S. Open and reaching a career-high World Ranking. Mohamed’s younger brother Marwan is next on the list to round off an Egyptian top three. The 24-year-old has also enjoyed his best ever season on tour with the Bristol-based Egyptian climbing up the World Rankings after consistently appearing at the latter stages of the big tournaments this season and winning his first ever World Series title at the El Gouna International. Germany’s Simon Rösner and Egypt’s Tarek Momen follow in fourth and fifth place, respectively. Rösner is one of the few players to have disrupted the Egyptian charge this season on the men’s tour after he claimed a historic win at January’s Tournament of Champions to become the first ever German World Series winner. Momen, meanwhile, has reached the finals of both the Qatar Classic and Tournament of Champions – losing out to Mohamed ElShorbagy and Rösner, respectively. Colombia’s Rodriguez takes sixth spot after his incredible win over the weekend in Hull to become the first South American to win a World Series event. 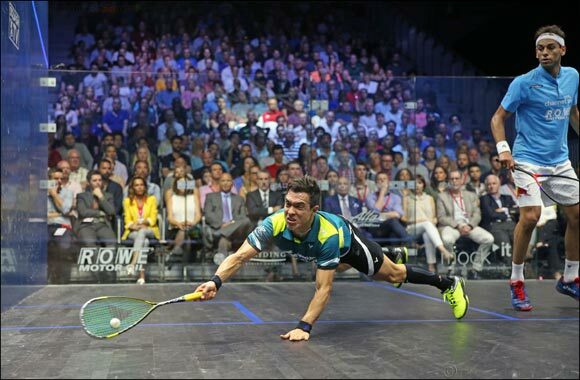 The World No.14 – who was unseeded at the tournament – defeated the older ElShorbagy in the British Open final to write his name into the squash history books. France’s Gregory Gaultier and Egypt’s Karim Abdel Gawad complete the line-up and, after struggling with injury throughout the season, they will be hoping to end the year on a high with victory in Dubai. In the women’s standings, Egypt’s World No.1 Nour El Sherbini leads the way after picking up 515 points with four World Series titles to her name this season, including her British Open win at the weekend after defeating compatriot Raneem El Welily. World Champion El Welily is second on the list after winning the El Gouna International title and finishing runner-up at four other World Series events over the course of the season to hold 425 points. Nour El Tayeb completes an Egyptian top three as the U.S. Open and Windy City Open champion scored 385 points to secure a place in her first World Series Finals. England’s Laura Massaro follows in fourth place with 215 points after a string of consistent semi-final finishes during the season, while New Zealand’s Commonwealth Games gold medallist Joelle King also marks her debut at the season-ending tournament, finishing in fifth place on the standings. France’s Camille Serme, Egypt’s Nouran Gohar and England’s Sarah-Jane Perry complete the women’s top eight. Supported by the Dubai Sports Council, the ATCO PSA Dubai World Series Finals will see players will go head-to-head in the best-of-three games group stages as they battle for a place in the semi-finals and finals, with one of the sport’s most coveted titles – along with a lucrative $320,000 prize fund which is split equally between the men’s and women’s events – up for grabs.